We’ve written extensively on IFRS 9, and in this blog, we’ll cover our IFRS 9 solution and process in depth. Principa follows four key project phases in providing an IFRS9 solution, as can be seen in the schematic overview of the process below. During phase 1 we conclude an initial review of the business in the context of provisioning. This includes getting an overview of the company, all business units and each lending product option. 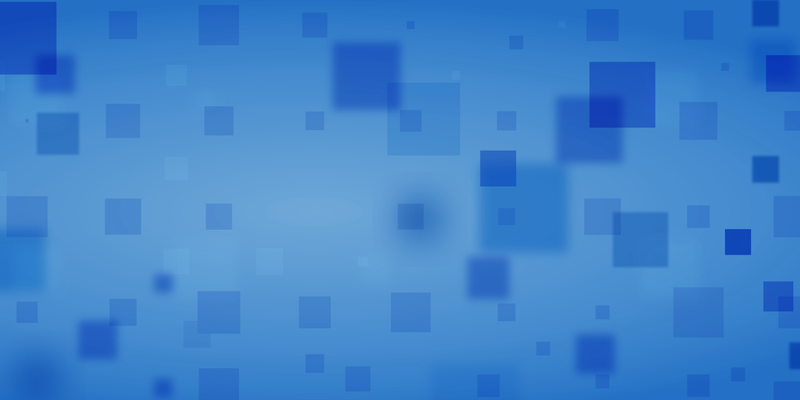 We'd also explore the data environment, check data availability and accessibility. The review would further extend to the business processes, credit risk management policies and practices, the current risk assessment toolkit (for both new and existing customers), the current IAS39 solution, -provision methodology and supporting principle and models, as well as the current provision coverage and any upfront IFRS 9 expectations and known compliance requirements or principle. This phase would also include a review of any existing auditor observations, an offsite documentation review and an onsite workshop. During phase 2, we’d aim to work with the client and their auditors to determine what the compliance principles are and what the final solution will look like. This phase ensures a smooth phase 3 and 4, and a clean audit after implementation. This phase includes an IFRS9 requirements workshop to facilitate discussion around requirements principles and methodology; data extracts; defining, documenting and facilitating a management agreement of the IFRS9 compliance principles and methodology and the related roadmap; and defining the delivery approach, resourcing and timing and all project dependencies such as data requirements. 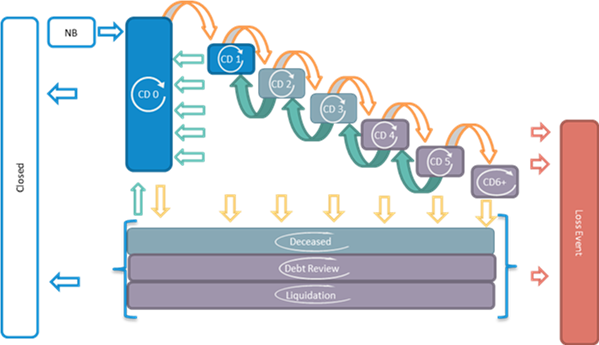 Markov Loss Forecasting: A Markov based solution used to model expected future cash flows, per risk state, over the product’s credit life cycle. This can be used to determine expected gross provisions. Includes embedded revenue recognition outputs. Report and Disclosures reporting templates: Automated reporting relating to IFRS9 credit loss movements over time. Standardised IFRS9 policy, model and user guide documentation templates. Our bespoke solutions are tailored to meet our clients' needs, and where a client’s environment does not enable the use of these off-the-shelf solutions, alternatives will be proposed during Phase 2. We develop a portfolio level propensity to default balance model to output default balances by month and specifically for at 12 months and lifetime. Our Markov ProVision solution determines the cash flow movements between a range of risk states (defined analytically). This solution allows the user to determine expected future cash flows, per risk state, which is useful for budget setting, credit risk monitoring and management. Below is an illustration of the underlying logic of a Markov Chain Solution. The following illustration shows how the data input for the run-off triangle solution is structured. The blue shaded areas indicate the recoveries relating to October 2017. Historical performance is used to determine an expectation of future recoveries, with the use of development factors (e.g. the relationship between the cash flows in area B are compared to those in area A to determine the likely cash flows to expect from month 4 to 5). The solution includes backtesting and could be used to monitor collections performance over time. Principa creates the capability to output a forward-looking scenario weighted final provisions. The forward-looking approach looks at modelling the relationship between macroeconomics and expected losses, both expected defaults and recoveries. This is done by using linear regressions to predict the 12-month error rates historically produced by the gross expected credit loss recoveries models. The underlying assumption is that these models (along with known business strategy change overrides) are not entirely accurate due to external factors that change the portfolio’s performance. As such, by resolving these errors with economic variables, we should be able to produce more accurate future provisioning results. This approach also ensures that there is no double counting of economic effects in the early performance of a portfolio already embedded in the forecast. 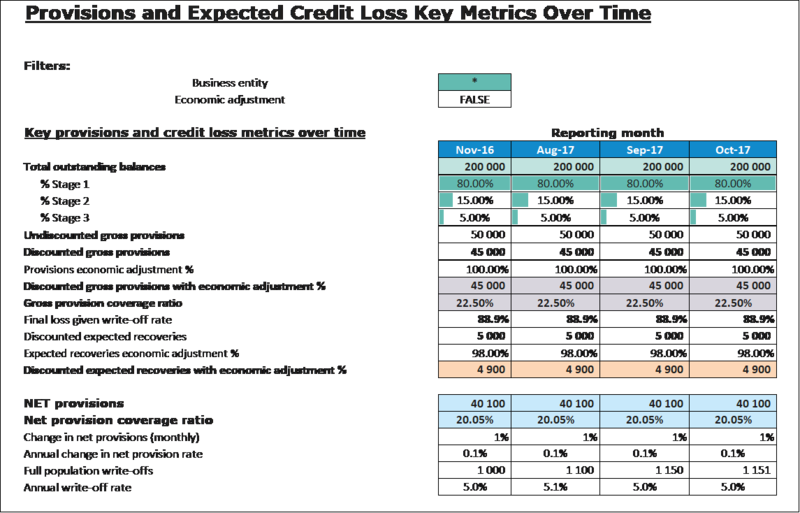 Although the life of an account might be longer, the first 12 months typically represent a majority of expected credit losses. The underlying assumption is that the error rate of the model of the initial majority short-term losses represents the longer term error position. Read more on the Key Considerations when Managing Your IFRS 9 Forward-Looking Overrides. The below image shows a summarised view of the IFRS9 Provision solution. Additional insights, in the broader reporting pack, allow you to assess why your provisions have increased/decreased over a specified period. IFRS9 Policy Framework Document – describing the policies and principles within which the provision model would function. 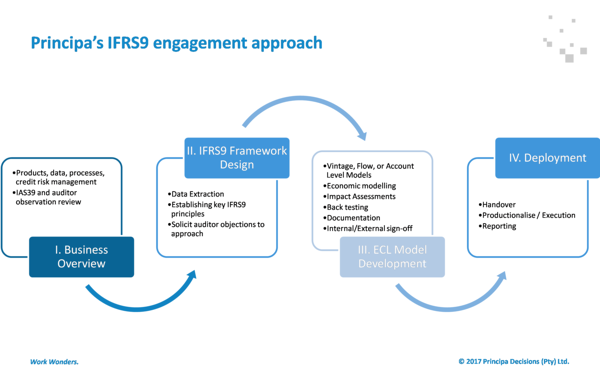 The IFRS9 Model Documentation – describing the development data, modelling approach and conclusions, including the validation results. The IFRS9 Model User Guide – describing the monthly run procedure. For further detail on the supporting documents and information we provide, read our blog Auditing Provisions: The Auditing Journey Over Time. After implementation, we provide backtesting to evidence model accuracy, deliver and handover the run procedures that includes a data solution (SAS / SQL) and excel total provisions calculation procedure and set in place detailed model write-ups covering both modelling methodology and run procedures. We also develop provision disclosure reporting, complete impact assessments, provide advice on provision governance structure and guidance to the impairment committee / executive committee through the sign-off for the adoption of the new provisioning procedures (IFRS9 compliance policies and procedure) and through the technical requirements for implementation into software for automation. Our projects are delivered with a high level of collaboration between clients and Principa to ensure a business focussed solution that will pass audit standards. It is also recommended to have key milestone checkpoints with the auditors such as to agree on the development principles. 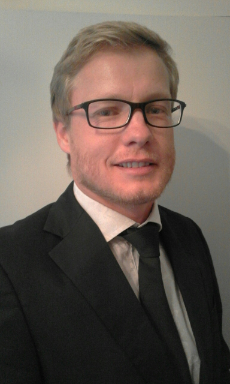 Prior to joining Principa in December 2013, Edwin had 13 years’ consumer credit (credit cards, revolving credit and personal loans) experience in Barclays Bank and Standard Bank SA with 10 years’ specialised in credit risk management across South Africa and Europe in particular United Kingdom, Spain, Germany and Italy of which over 3 years with Chief Risk Officer accountabilities. Edwin is considered an expert across the full customer life cycle and has lead and implemented a number of highly successful credit, marketing, collections, scoring and provisioning initiatives. Since joining Principa, Edwin continued to successfully deliver risk-based and profit-based initiatives to key clients (specialised lenders, large retail banks and retailers). He holds a M.Comm degree from Stellenbosch University.